… yup Little J. Meet you outside at 11am? Sadly for Little J, Nate had to cancel, but luckily for me, Big J (Jacq) didn’t. 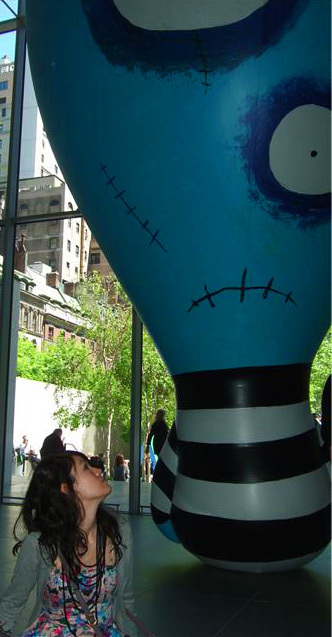 I can’t say I’m the most dedicated fan of Tim Burton’s work, having only seen a handful of his films, but when I found out that I was in New York for the last weekend that Tim Burton was exhibiting at the Museum of Modern Art, I signed up immediately. After a ‘Welcome back to New York’ breakfast of brioche French toast at my favourite breakfast cafe Pershing Square, we trooped over to MoMA only stopping to stare with a sinking heart at the queue which was snaking around the block. Thank god we booked our tickets online and were allowed to smugly skip the queue! (Although I didn’t feel quite so smug when the ash cloud threatened the entire trip and we were facing wasted tickets…). Once inside, we were treated to the entire range of Tim’s creative work, from scrappy sketches on bar napkins to music videos. The exhibition explored the timeline of his career starting with his doodles in school books which display his distinctive style even at a very early age, to collections of paintings, storyboards, moving image works, maquettes, conceptual art and cinematic paraphenalia. With a larger collection of stripes than a Breton show room, the dark, comic angst that runs through Tim’s films was evident in full force from even his earliest work. Crazy cartoon strips and sarcastic humour showed us a man stifled by his home town who managed to break out without changing the basics elements of his style to become one of the most recognisable film makers of this generation. And I wish I could’ve taken some photos to show you just how awesome the exhibition was, but I seriously suspect that I’d have been rubgy tackled by the militantly strict bouncers and thrown out on my ear. 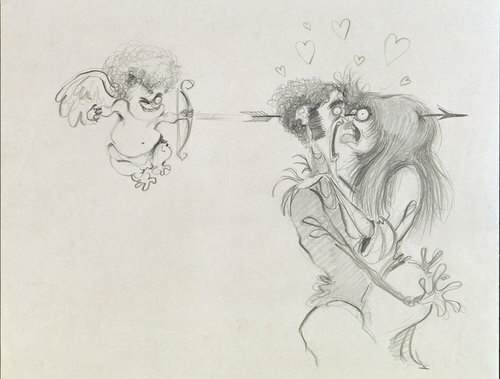 Ah, true love… courtesy of Tim Burton.